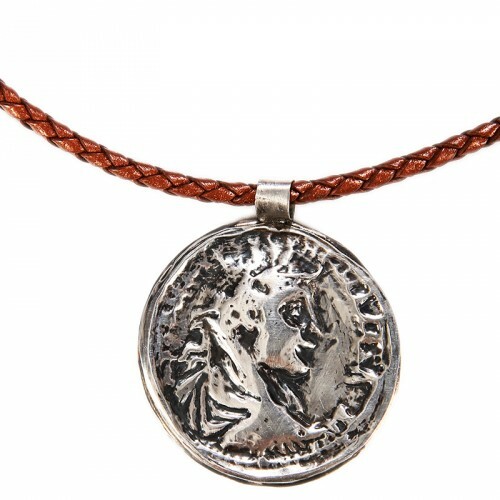 The Emperor Severus Alexander coin necklace produced by “Erhani” silver technique was designed and hand-made by the artist Seher Celep Yilmaz. Alexander is the last of the Syrian emperors (224 AC). Under his mother’s influence, he strived for improving the moral values and living conditions of people. During his period, taxes were reduced, literature, art and science were encouraged and the money lending offices were institutionalized for the aim of reducing the interests. Erhani silver technique was developed by the artist Erhan Simsek where primitive processing techniques involving 27 and 07 microns of silver plates, wooden pens, files, scissors, grip and hand tamper are used. Along with arts such as calligraphy and miniature, patterns and icons from the Anatolian civilizations are adapted to silver in a meticulous manner. Both the front and reverse sides of the products are ornamented. Material: Silver with a fineness of 925, brown leather. Dimensions: Diameter 3 cm, leather length 25 cm. The artist has been working on hand-made art jewellery techniques with her family since the year 2000. 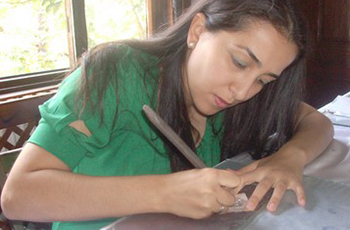 After having worked in special jewellery workshops in Beypazarı and Ürgüp, she focused on Erhan-i silver techniques in her hometown, Amasya. The artist who published two books on Erhan-i techniques currently gives lectures at the Public Education Centre.